I saw these Pork Shoulder Blade Steaks at the grocery store for the first time and I had to buy them. They were huge! And looked so different from the typical pork chops. I was pleased at the result of this simple dish. 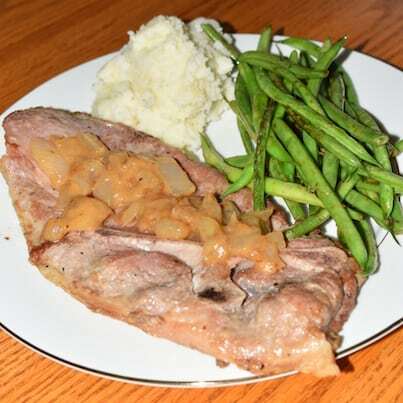 Pork steaks are so flavorful and tender, this is a great alternative to the boring pork chops. Since this recipe is so quick to prepare, I usually have leftover mashed potatoes that I have previously frozen into family size containers. I will remove the mashed potatoes from the freezer and defrost/heat while I'm cooking the meal. If making mashed potatoes from scratch, don't start on the pork until after the potatoes are cooked, since you won't have time to mash the potatoes. In large skillet, heat 3 Tbl olive oil. Sprinkle pork steaks liberally with Garlic Salt and Coarse Ground Black Pepper. Sear pork chops in the pan on both sides. Layer a cooking sheet or baking pan with tinfoil and spray with Olive Oil cooking spray. Place the seared pork on the pan and place in the oven to bake at 350 degrees while you finish the rest of the meal. Do not wash the pan you cooked the pork in. Add 2 Tbl Garlic Olive Oil and add the green beans. Sprinkle lightly with Garlic Salt & Coarse Ground Black Pepper. Cook on high, stirring constantly, for 2 minutes. The green beans may get seared, but that's ok. Once the green beans are cooked to your liking. I prefer my green beans crispy. Optional: If you like yours less crispy: reduce the heat to medium-high and add 1/2 cup water to the pan and cook for a couple extra minutes. Remove the green beans from the pan and DO NOT WASH THE PAN. Add the remaining 2 Tbl of Garlic Olive Oil and heat on high. Add the diced onions and cook until they start to soften. Add the butter and cook for 1 more minute. Add the vermouth and cook until mostly dissolved. Add the flour and cook for 1-2 minutes. Slowly, while mixing continuously, add the chicken broth. Cook until thick and bubbly. 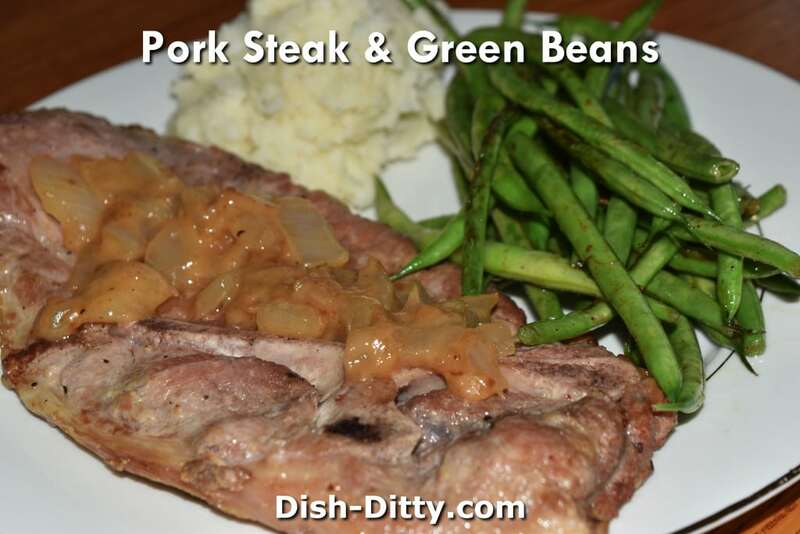 Once you are done with the green beans and the sauce, the pork should be perfectly cooked. Remove the pork from the oven and serve everything together with Mashed Potatoes. 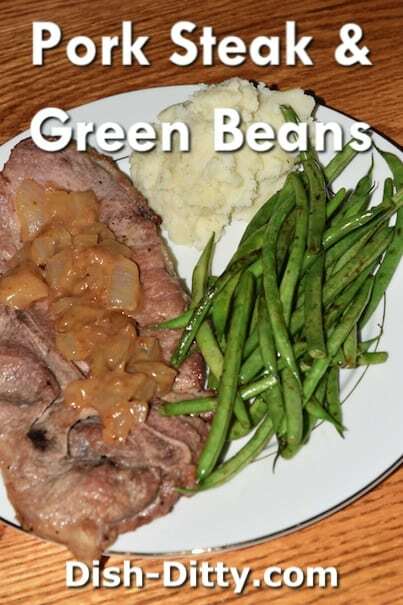 No Replies to "Pork Steak & Green Beans Recipe"